Yup I'm hurting, Yup it's hot, and Yup, I'm doing it anyway... GO ME! Fast forward.......... after a super busy work schedule, we got her ready for Sunfish Tri back in July. With big smiles, she finished strong and ready to do another... ADDICTED!! Woop woop! 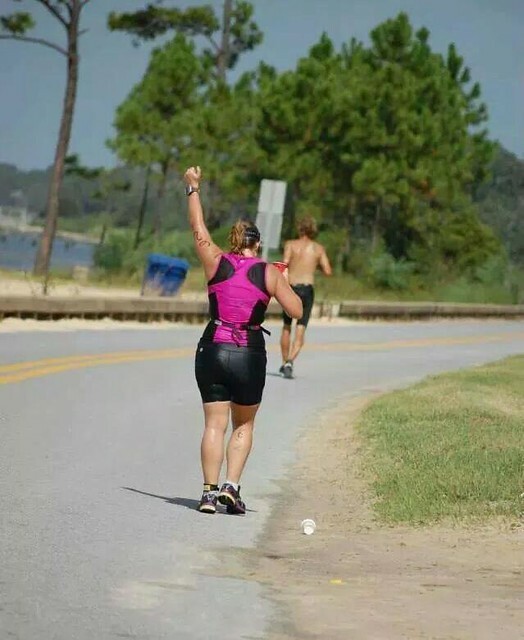 "I am not quite sure how it happened, but today I completed my first olympic distance triathlon. I signed up for the One Coast Tri with some trepidation. I was supposed to do the Tradition's Triathlon in April, but due to my crazy work schedule I was unable to be in town for the race. I decided I would sign up for the One Coast Tri inaugural race. I have been training for months and completed a shorter sprint triathlon in July as a training race for today. Several of us decided to do a practice swim yesterday so that we would have an idea of what to expect on race day. What we didn't expect was to see a 9 foot alligator cruising by the channel marker just before our "practice swim". He was swimming the opposite direction and he didn't look hungry, so we all decided to brave it and jump on in. It turned into a nice swim and I think it just made us all that much faster. Race day began with a very early car ride to the race site, setting up my bike and gear in transition, then another much shorter warm up swim just before the race. I entered the water this time feeling much safer. Lots more people swimming today. It was a mass start so the swim itself was a little more difficult trying to maneuver around all of those people. The water was fairly calm with the exception of the other swimmers and the occasional wave. I swallowed a little water and got stung by a jellyfish, but that just proved to be another learning experience for me. The sun was also bright and in my eyes on the way back, but I just kept going, one stroke and kick at a time. I finished the swim in about 38 minutes. Not as fast as the day before, but respectable for my first triathlon ocean swim. I was also all smiles when I got out of the water. Nice and cool from the water. Then came the short run to the transition area. I poured some fresh water over myself then, promptly sat down to put on my socks and running shoes (I still have cages on my bike...no clip in pedals yet since I am still new to this whole triathlon thing) and threw on my sunglasses and helmet and I was off on the bike. The first few miles on the bike were uneventful. The bike is my weakest event and I was just trying to maintain a good speed. The course was flat and it wasn't until the bridges on Belle Fontaine Rd, about 10 miles in, that I got uncomfortable. Mental note to myself at that point that I have got to get a new seat and arrow bars. We made it to Belle Fontaine beach and a nice stretch of brand new black top roads. After the turnaround point, there was a little bit of a tailwind and that helped on the return ride. There was one scary moment when a guy in a white SUV was not looking and almost ran me over because he was in too much of a hurry to stop at his stop sign. I made it back to transition after about an hour and a half, those 25 miles under my belt. It was getting really hot by then. In transition, I got off my bike, put on my running visor and was cheered on my friends and volunteers as I started the run. I have to say that my legs really did not feel like running at that point, but I started off at a good pace. My strategy was to follow a run/walk routine where I would I run for 5 minutes, then walk for one minute. I made it through the first two miles. It was unbearably hot, but when I made it to the first water station and was greeted by friends who were volunteering, I got doused in ice cold water and was able to keep running. My run intervals did get a little shorter after that. There were some very nice folks set up outside their house in between the two mile and four mile water stations. This family was set up at about mile three and had a little girl with a water hose ready to cool us off as we were going by and they were handing out water as well. It was a nice little surprise during the run. There were several sections of the run that were shaded, but there were also a few hills that almost did me in. I made it to the mile 4 water station and was again greeted by friends who were volunteering and who dumped more cold water over my head and back as they were shouting words of encouragement that gave me the energy to go on. I finally made it to the last section of the run along front beach. I have run that road so many times and knew exactly how far down the finish line would be. I continued my slow run along the seawall until I was almost to the finish line and saw my friends standing there cheering me on, it gave the the last bit of energy to sprint to the finish line! My final time was three hours and twenty one minutes. I have never been so happy to be finished! The heat just saps all of your strength, but it never ceases to amaze me how quickly the energy comes back when you cross the finish line and are surrounded by so many positive people. I felt such a sense of accomplishment and pride at having completed something that I never thought I would have been able to do when I was younger. If you would have told me five years ago that I would have completed something like this, I would have laughed in your face, but the people in this running/cycling/swimming community are some of the nicest and most positive you will ever meet. They are not petty or jealous. They simply encourage each other and strive to be the best they can be. I cannot say enough about how inspiring they all are and I feel blessed to have become friends with so many of them! So if many of them read this, I would like to send out a heartfelt "thank you" to them all and especially to my fabulous coach, Lisa, for introducing me to this amazing and exciting new world!